I backed into the heeling box and as my partner was setting his head horse I did something I have never done before – I looked at my watch. It was 10:34 at night and I still have 90 miles to drive home from this rodeo with a full day of irrigating and checking yearlings starting in just a few hours. This is when I knew I was beginning to lose my edge. All of my years competing in the arena and now I am worried about the time? I am the type of competitor that completely shuts everything out except for the task at hand. When I back in the box you could run a herd of monkeys through the middle of the arena and I wouldn’t know it, I am concentrating on one thing and that is the two feet on the back end of the steer that is standing in the chute. But not that night. Things were mixed up. 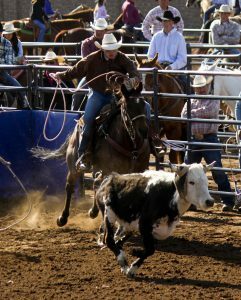 At this rodeo we were roping in the slack that was after the evening performance and it was getting late. I simply did not keep my eye on the goal. Do we do this sort of thing in life? Do we lose sight of growing closer to Jesus Christ and being more like him? Paul writes in Phil. 3:12 “Not that I have already attained, or am already perfected; but I press on, that I may lay hold of that for which Christ Jesus has also laid hold of me.” NKJV Life happens. We have interruptions, difficult relationships, storms of life, or simply laziness that keeps us from knowing Christ better and working for His kingdom. We take our eyes off of the goal and it happens at some point and time to all of us. Living for Christ and being “Christ like” is not an easy task, not even for Paul. Verse 14 says, “I press toward the goal for the prize of the upward call of God in Christ Jesus.” Paul had received salvation about 30 years prior to writing to the Philippians and the goal he is referring to is spiritual maturity, to be more like Christ so people can see Christ through us. Set your eyes on the goal, don’t be detoured and keep living for Christ.